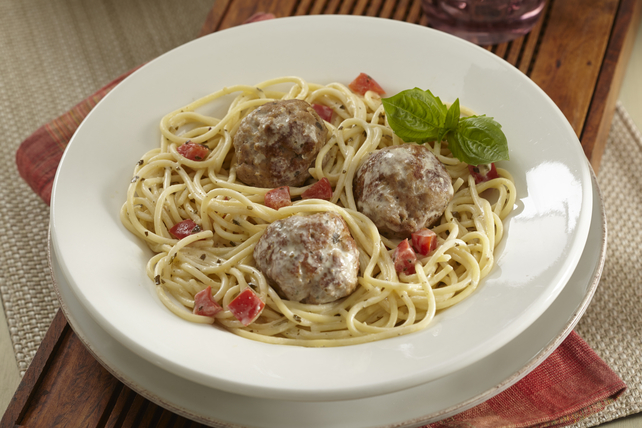 Make our Creamy Pesto Spaghetti with Turkey Meatballs for your entrée tonight! You'll only need 35 minutes to prepare this delectable restaurant-inspired spaghetti with turkey meatballs. Mix turkey, Parmesan, bread crumbs and garlic just until blended. Shape into 12 meatballs, using about 1/4 cup turkey mixture for each meatball. Cook in large skillet sprayed with cooking spray on medium heat 5 to 7 min. or until meatballs are no longer pink, turning occasionally. (Meatballs will not be done.) Remove meatballs from skillet; set aside. Cook spaghetti as directed on package, omitting salt. Meanwhile, add peppers to skillet; cook and stir 3 min. or until softened. Add cream cheese spread and pesto; stir. Cook on medium-low heat 4 min. or until cream cheese spread is completely melted and sauce is well blended. Drain spaghetti, reserving 1 cup of the cooking water. Add spaghetti and cooking water to cream cheese sauce; mix lightly. Top with meatballs; cover. Cook 13 min. or until meatballs are done (165°F). Serve with a bagged green salad tossed with your favourite Kraft Dressing.